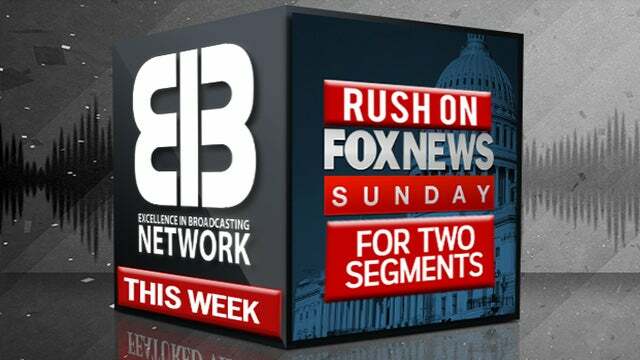 Don’t Miss Rush on Fox News Sunday — for Two Segments! RUSH: I just heard from the Fox News Sunday people. As you know… Well, maybe you don’t know, because I really haven’t touted it enough. I’ve only mentioned it once. See, talking about myself is never at the forefront of my mind. But anyway, they’re going to have me on in two segments. I was originally going to be on the third segment for 12 minutes, which would start around 9:28. But now they’re going to have me open the show and then come back later in the show. So I’m going to be first… I don’t know what the first segment length is, but it will be that and then back in the hour. They’ll have two panels, one before the second segment of mine and then their usual show wrap-up panel after my segment. The second segment is 12 minutes. That will be the biggie. But they’ve added. Essentially, they were going to have me on at 9:28. Fine and dandy. They’ve now added another segment at the top of the program. So I wanted to make sure you knew. I haven’t talked about it, just that one time. (interruption) Oh, they’re going to tell me what the topics are. They never lie to me about the topics, and they never don’t tell me. Yeah, I’m sure. I can tell you right now what it’s going to be. My guess. It’s going to be Florida and the guns within the context of gun control that everybody else is demanding. They probably will bring up this indictment from the Russians. No question about that. That will be discussed, and they’ll probably ask, “How do you think Trump is doing in general?” and then maybe something on immigration. They may ask me how my life’s going at the end. You just never know. But if I had to guess, those will be the three primary things. And I’ve got to remind you — I have to remind you. You’re all snarky in there. You think this is…? (interruption) Well, he has to interrupt me. (interruption) Well, he conducts an interview and after a certain passage of time, after I’ve answered a question he’ll move on and ask a follow-up question or a new question. He routinely tells me that he is bombarded with complaint emails from people who listen to this program and are mad at him for stopping me, for interrupting. So before each appearance he asks me to tell you that it’s okay when he interrupts, that it’s a “formatic” requirement for them. I say, “I’ll tell the audience each and every year not to give you any grief.” So any other questions about this? (interruption) Okay. So that’s that. Fox News Sunday. It’s not the Fox News Channel. This is the Fox broadcast channel. Whatever in your market the Fox NFL Sunday is on, wherever the football game is broadcast.